« Someone just tried to scam me over the phone! 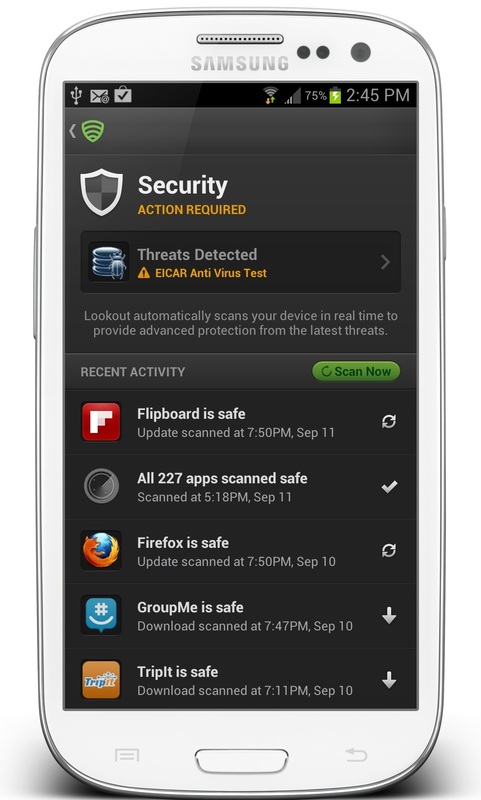 Lookout is a free security application (app) available for both Android and iOS used by millions of users around the world to protect their devices from malware, viruses, spyware with the ability to backup and restore data remotely. Both versions are worth installing but the Android version provides more functionality due to the open architecture of the operating system. Locate: The phone can be setup to found when lost just like “Find my iPhone” and is a good backup for iOS users. Scream: A screaming sound can be played remotely to the phone even when the ringer is turned off. System Advisor: The app will notify the user if the phone is jailbroken. 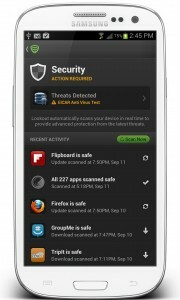 Process Monitor: The app monitors all applications on the phone and notifies the user if any malicious activity. Wi-Fi Security: Notifies the user when the device is connected to an unsecure Wi-Fi connection so that the user won’t unknowingly transmit passwords and other sensitive information. Location Services: Makes the user aware of apps downloaded that are accessing the phone’s location data. Backup: The app backs up the phone contacts without the need to sync and makes the contacts viewable via any browser on the Web site mylookout.com. Signal Flare: The app automatically records the phone’s last location right before the battery dies giving the user a chance to find it. Lock Cam: The phone’s camera is used by the app to take a photo and grab the location when anyone has three unsuccessful attempts at unlocking the phone. Privacy Advisor: Makes the user aware of apps downloaded that are accessing the phone’s personal data. Safe Browsing: Monitors activity and Web sites visited for malicious activity including phishing. Lookout Premium: For $2.99/month or $29.99/year, users will have the ability to backup all data and restore it to the device in addition to contacts. Select App Store for iOS devices or Google Play for Android devices and search for Life360 and install the app. Launch the app and enter e-mail address to login or create and account. Follow the setup directions for setting up an account.